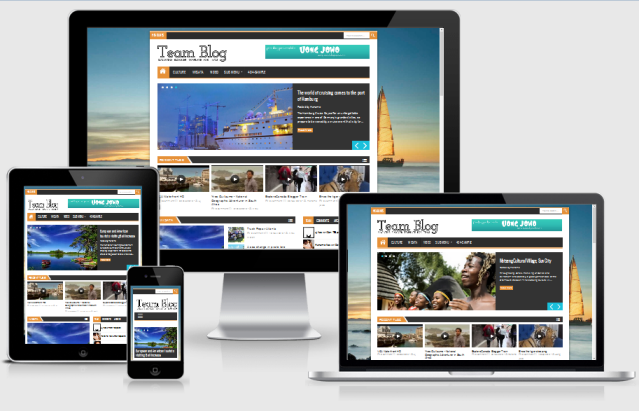 Team Blog Responsive Blogger Template is a perfect Premium Magazine Theme designed by Uong Jowo [Best Web and Graphic Designer] having lots of professional Features such as Advertisement Ready, Fast Loading Page Speed, 1 Right Sidebar, 3 Footer Column, Simple Label Style, Stylish Popular Posts Widget, Awesome Social Media Sharing Gadget, Beautiful Video Slider, news Ticker, Flexible Search Bar, Back Ground Image, 404 Error Page Drop-Down Label Options and much more other features have been added in this pack. In other words it is as same as Dynamic. You must use this web-design for your site if you really want to make your website more attractive and user friendly than others because it glows professional look and value with its stunning options. This web-design can be used for News, Information Technology (IT), Internet Tips, Mobile Technology, Games, Software, Wallpapers and all other topics. It easily adopts all kind of devices including Android Phones, Tablets Screens, Laptop and Desktop Screen Resolutions are loaded within seconds.